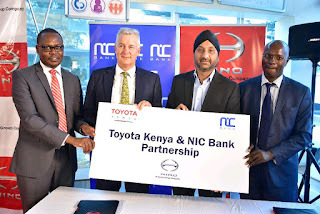 NIC Bank today partnered with Toyota Kenya ,the largest motor vehicle manufacturer in the world in a deal that will see the lender's customers acquire trucks on credit basis. In the deal agreement, NIC Bank will provide the financing while Toyota Kenya will provide the vehicles ( Hino trucks). Financing will be up to 80% the value of the truck and repayable within a maximum of 60 months with a 60 day grace period. To apply a customer must identify the trucks from Toyota showrooms and then visit any NIC Bank to apply for the financing.